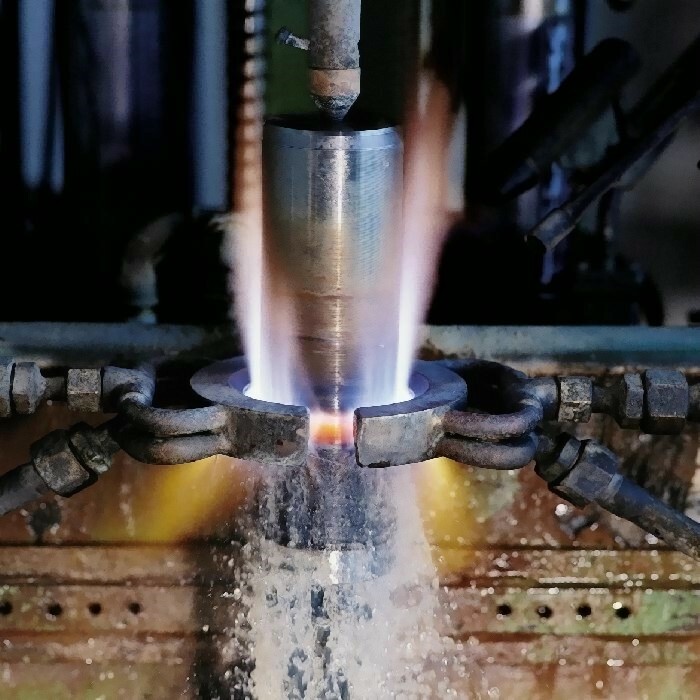 Flame hardening belongs to the group of surface-hardening processes and is suitable for steels with a carbon content of 0.4 to 0.7% or for the surface hardening of cast iron and cast steel products. The area of application is particularly limited to hardnesspenetration depths of 1 to 6mm and mainly extends to large workpieces with wall thicknesses of over 15mm and the partial hardening of surface layers of functional surfaces. Flame hardening requires little technical effort and can be used for almost any structural casting design. The equipment used for flame hardening can range from simple hand torches to program-controlled special machinery. Heating is usually accomplished by means of gas torches using oxygen/natural gas or acetylene mixtures with an oxygen excess of 10 to 20%. Cooling is mostly done with a downstream water jet, the surface layers being hardened by the formation of martensite and ledeburite (Fig. 1). When hardening sensitive steels or castings, it is also possible to use emulsions with an oil-like quenching behavior instead of water. Here, the process involves two steps: first, the casting is heated up completely, then the entire casting is quenched. Heating and quenching is done in one step, a narrow zone is heated and quenched by a targeted water jet. Hardening is therefore performed in the form of a line or linear pattern. The hardnesspenetration depth results from the combination of component cross section, torch settings and heating duration. The hardnessdistortion occurring during flame hardening is generally slightly lower than with normally hardened components. Spur G., Stöferle Th., Handbuch der Fertigungstechnik, Band 4, Carl Hanser Verlag, Munich Vienna, 1987.